An inspirational gift for your grandma or grandma who goes by another name. 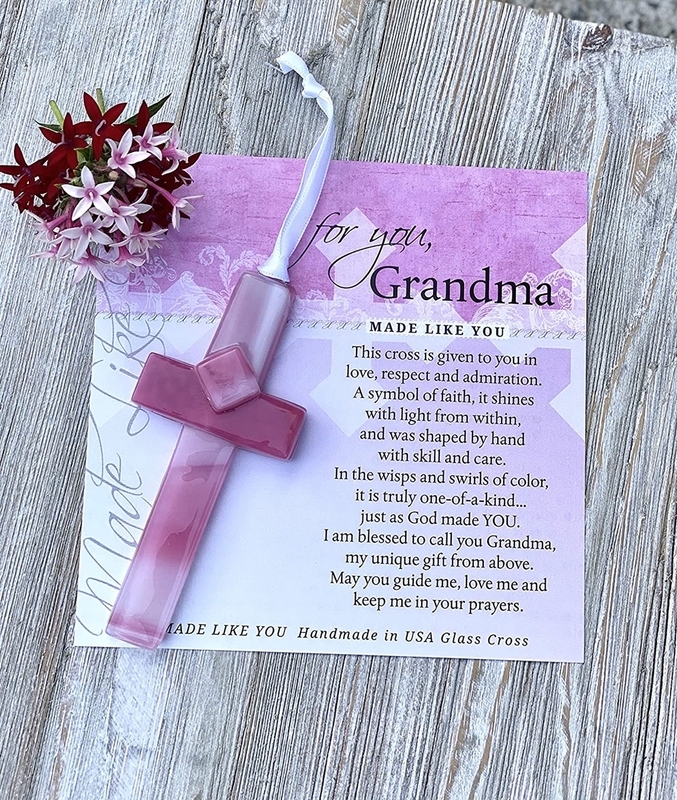 If you are looking for a gift with a message that will touch her heart, you have found it in our 4" glass cross handmade in the USA. We will personalize the art with her special Grandma name in the title and text of the artwork. 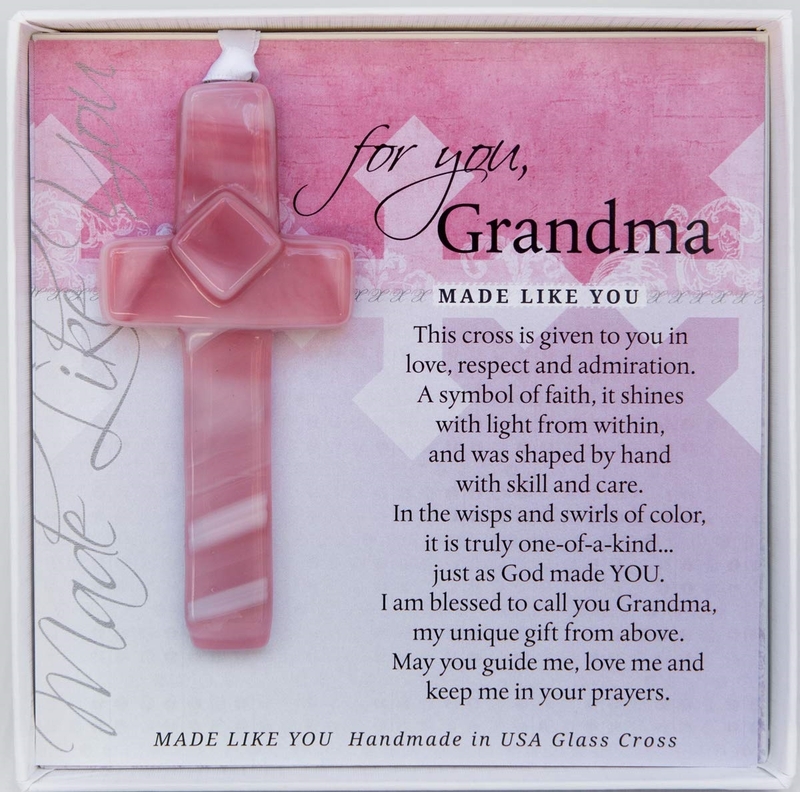 Each cross for grandma will be pink, however it will be unique in the swirls and colors created by the firing of the glass. The Handmade cross hangs from a white satin ribbon, perfect for display anytime of year and any place. Give this personalized grandma gift for her to hang on a rear view mirror, window, drawer knob, bible page marker, ornament stand or Christmas tree. 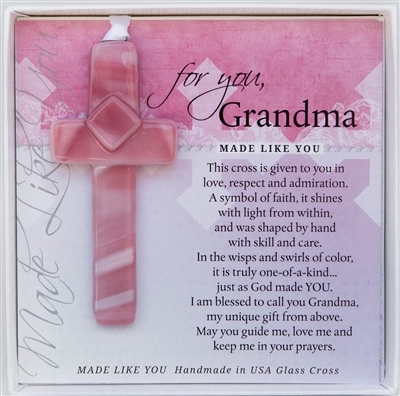 Your grandma will love the Christian message this gift of faith sends...YOU ARE UNIQUELY CREATED. Gift-boxed in white 5.5x5.5 clear top box with Made Like You sentiment and art. The cross is beautiful and I am excited for the kids to give it to Grandma for Christmas. I am sure she will love it! The poem makes it so special. Plus, I love that it is made in the USA. I am very pleased and would purchase from The Grandparent Gift Co. again.